This year Austria has made an internal selection unlike the years before. The Austrian broadcaster ORF has chosen Conchita Wurst, a special and very extravagant artist, who already made a second place in the national final 2012 with the song “That’s What I am”. This year this was one of the last songs which have been announced to the EBU. Actually there are two personalities: the private person Tom Neuwirth and the art person Conchita Wurst. The private person Tom Neuwirth was born in 1988 in Gmunden, Styria. He studied fashion Graz and has been a candidate in the ORF casting show “Starmania” and lives in Vienna. 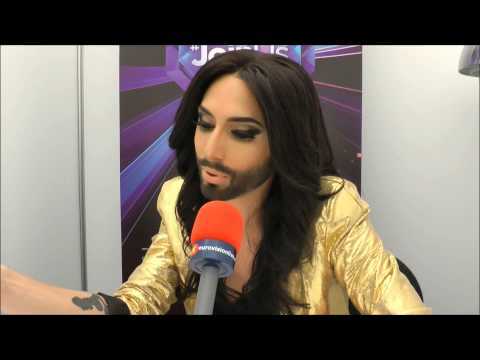 The art person Conchita Wurst has been created by Tom and combines the look of a woman with a masculine beard. This is indeed a very unusual look. This beard of course is a statement and stands for tolerance and against discrimination. The reason for this can be found in Tom’s life history as he had to live with discrimination. He is arouses discussions about terms like “different” or “normal”, in his opinion the look, gender and heritage of each individual does not matter, it’s about dignity and freedom for everybody. Everybody should live his life, like you would like to have it unless somebody suffers from that, Conchita said. In Conchita’s heart there can be found two hearts. This is maybe important to know before judging or uttering an opinion. The song “Rise Like A Phoenix” is a power ballad like no other in this year’s ESC. It’s totally different form Conchita’s first song “That’s what I am”, but the thematic is similar, being yourself and change if you want. The arrangement reminds a bit of a James Bond song. There is a lot of drama and a great climax in the song, with an orchestral recording. This song perfectly suits to the art person Conchita Wurst, glittering and shining. There might be some similarities with Dana International, who won the ESC in 1998 with “Diva”, she is transsexual. Not to forget men in women’s clothes like the Slovenian entry “Samo Ljubezen” by Sestre in 2002 (13th place), or the art figure Verka Sedutchka from Ukraine, who came second with “Lasha Tumbai” in 2007. TV spectators who are going to see Conchita for the first time might get irritated, but with this song and a great stage show and an extraordinary outfit this might even convince the critics. This is an outstanding song from Austria with great winning potential. Good choice Austria! 47 times Austria has taken part in the Eurovision Song Contest already. There were certain years when Austria missed out for a while. 2011 Austria came back after three years with new inspiration and enthusiasm, Nadine Beiler sang “The secret is love”, she has qualified for the grand final in Düsseldorf and made the 18th rank with a stunning performance, the host country Germany awarded this with 12 points! The old twist between Germany and Austria regarding the voting has smoothened. After many years a big national final is being been arranged by ORF to find a star for Austria every year now. Please accept cookies to play this video.By accepting you will be accessing content from a service provided by an external third party.